Tara has been entered for her first ever gym competition and she's desperate to win. But she's so busy learning the tricky routine that she doesn't have time for her best friends. When they all fall out, Tara realizes that her friends are more special than any medal. Can she find a way to make up with them and follow her gym star dreams? 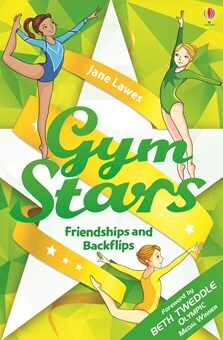 With a foreword by Olympic medal winner Beth Tweddle. Tara Bailey stood at the gate outside Hollypark Secondary School, where she was about to start in Year Seven. She was waiting for her best friends in the world to arrive. She’d been in the same class as Emily and Kate all the way through junior school, but now that was going to change. There were three Year Seven forms at the secondary school, and for the first time since Tara, Emily and Kate were four years old, they were going to be split up. Students were flooding through the school gates and Tara was worried that she’d get swept along, too. Surrounded by large boys and tall girls, she felt so…little. At the top of their junior school, she and her friends had felt like grown-ups compared to the babies sitting in the front row at assembly. Now they had to start all over again. The fact that she was almost lost in her new uniform didn’t help. The navy blue V-neck jumper was slightly too big, but the main problem, Tara thought, was the grey skirt, which came down below her knees. Usually she didn’t mind being small for her age – it was actually a very good thing in gymnastics, which was all she cared about most of the time – but right now she was wishing that her legs were a little bit longer, or the skirt a little bit shorter. She had gymnastics after school so, as well as her rucksack, she had to carry another bag containing her leotard, a bottle of water and a snack. She felt weighed down already – and she didn’t even have any school books to carry yet! She moved away from the gate a bit so that she wasn’t caught in the crowd. Emily should have been on the same bus as Tara, but she’d sent a text to say she’d missed it and was waiting for the next one. Kate’s bus came from a different direction. As she waited for them, Tara felt that she’d give anything to be going back to their cosy Year Six classroom this morning. She’d secretly been a little bit jealous when she saw her younger sister, Anna, dressed in the junior school uniform before she left. Lucky Anna still had years ahead of her in the small, friendly playground and the colourful classrooms. Meanwhile Tara would have to find her way to different classrooms for every lesson, and she was sure she’d get lost. “Tara!” She heard someone squeal her name behind her and turned around. “Lindsay!” she replied, seeing her friend from Silverdale Gymnastics Club. She had started doing Acrobatic Gymnastics there during the summer and Lindsay was her partner and her best friend at the gym. For the first time since she’d got out of bed that morning, Tara stopped worrying for a moment. Lindsay ran to give her a hug and Tara felt better instantly. Even though she was in secondary school now, it wasn’t as if she didn’t know anyone, she reminded herself. A lot of people from her junior school class had moved to the same school as her. And then there were Lindsay and Megan, another Silverdale gymnast, in Year Nine. Even though Tara knew she wouldn’t see them much because they weren’t in her year, it was nice to know they were there. “Nothing much,” Tara replied. “We just got back to work on normal things like somersaults and balances.” At the end of the summer, Silverdale had performed a big gym display at the town fête. They’d spent weeks working on it, so they hadn’t had much time to work on skills like somersaults and backflips. “I practised balances with Sophie, because Megan was on holiday too. We were both abandoned by our partners.” Tara grinned cheekily at Lindsay, forgetting for a moment that she was in a strange new school. “Did you have a good time?” Tara asked. “You too.” Tara waved, but her smile faded with worry as Lindsay walked away. I’ve still got Kate and Emily, she reminded herself silently. And as soon as she thought it, they were beside her. They hugged each other quickly and then walked through the gate together. All of Year Seven had to go to the main hall first to meet their form tutors. They’d had an induction day at the end of last term, so they knew where they were going. “Me too,” said Kate and Tara in unison. “Okay.” Tara nodded. Her voice sounded as tiny as she felt. She took a deep breath, and they went inside. The big room was full of Year Sevens already. Tara and her friends were told where to go by a teacher with three lists. They all smiled nervously at each other, said goodbye, and headed for separate corners of the room. As Tara found her form tutor and had her name ticked off on her list, she couldn’t help looking back over her shoulder. Emily was hovering on the edge of her form group and Kate had already been swallowed up by a crowd of blue and grey. A 10/10 read - maybe that should be a gold!